Jockeys who have won the Kentucky Derby are members of an elite fraternity. Since 1875, only 98 men have ridden thoroughbreds to victory on the first Saturday in May. 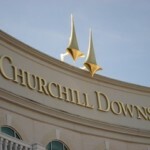 Amidst the pomp of Derby Week, two winning jockeys who took the roses in the 1950s – Bill Boland and Ray York – will return to Churchill Downs for Derby Day. 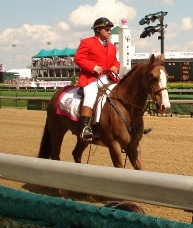 Both of them rode in the Derby five times, but they are in Louisville for the first time as spectators. Boland, a member of the Racing Hall of Fame, won the Derby in 1950 aboard Middleground. York, who won the Derby in 1954 aboard Determine, still remembers the thrill of that day. “I was the king,” said York, 73, who lives in Taft, Calif. “That’s a kid’s dream.” As a child pretending to be a jockey, his race of choice always was the Derby. 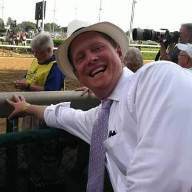 “I was Johnny Longden, and I was in the Kentucky Derby,” he said. Jane Dempsey, who organizes the annual Derby Junket Tour, arranged for York and Boland to come to this year’s Derby. 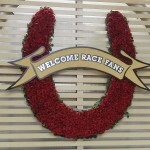 Yesterday, they were honored at the Galt House Hotel and Suites where they added their handprints in cement to the “Gallop to Glory” display, which commemorates winning Derby jockeys. Boland won in his first time riding in the Derby, as a 16-year-old apprentice rider no less. “They say it’s the most exciting two minutes in sports – it’s true,” said Boland, 73, of Palm Coast, Fla. “I was at the top of the world.” Middleground beat out favorites Hill Prince and Your Host and paid $17.80 to win. The day before the Derby, Boland also won the Oaks. “I was on a roll right then,” Boland said. “I didn’t think I was on the best horse (in the Derby), but I thought I had a chance.” Bob Hope presented the trophy to Boland in the Winner’s Circle. Middleground later placed second in the Preakness and won the Belmont Stakes. Boland, who began riding professionally at 14 after lying about his age, rode in four more Derbies (’51, ’54, ’59 and ’66). But the closest he came to winning again was in 1959 aboard Sword Dancer when he lost by a nose to Tomy Lee. He notched 2,049 career wins in 21 years of riding, but the Derby remains his most notable. “You can win 8,000 races, but everyone knows the Derby,” he said. York had a bumpy ride aboard Determine when he won in 1954. “I almost fell,” York said. “I hit a horse named Timely Tip. I hit heels and stumbled bad.” But Determine recovered to beat out Hasty Road and pay $10.60. “He was the best horse that day,” he said. 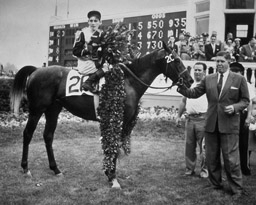 York was 20 when he won, and he already had ridden in two Derbies (’51 and ’52). He also lied about his age to begin riding when he was 15. He later had mounts in the ’59 and ’62 Derbies. After winning, York’s thoughts turned to his father who bought him his first horse but died before he ever got to see his son race. “When I crossed the finish line, I just looked up and said, ‘Thanks, Daddy.’ ” Determine holds the distinction of being the first gray horse to win the Derby. “That’s one record they won’t break,” York said with a laugh. York chalked up more than 3,000 wins in his career, and he holds the distinction of being the only jockey to ride in seven decades. But his Derby win will always stand out. “I’m still proud to say that I won the Kentucky Derby,” he said.